The countdown to the final episode of My Little Pony: Friendship Is Magic has begun. The premiere of the show's ninth season, entitled "The Beginning of the End," aired over the weekend with some pretty big revelations about what to expect for the finale. This is still far from the end of the My Little Pony franchise as the series has been rebooted many times since the '80s. It's just that this particular iteration of it that began in 2010 was by far the most popular and lasted the longest. It's hard to believe it's been going for almost a decade now. The series was incredibly intricate in building it's vast world of Equestria and wove tons of fun new mythology into the franchise. It also placed heavy focus on princesses and princess culture in general. The pony kingdom of Canterlot is run by Princess Celestia. Showrunner Lauren Faust wanted to her make a queen but got turned down by the studio when they claimed that girls see princesses as good and queens as evil. A little later in the series, Twilight Sparkle was promoted to the rank of princess as well, but the meaning behind that was a bit muddled when Princess Celestia and Princess Luna were still considered to be the ones in charge of Canterlot. "The Beginning of the End" cleared up some of that confusion for us. 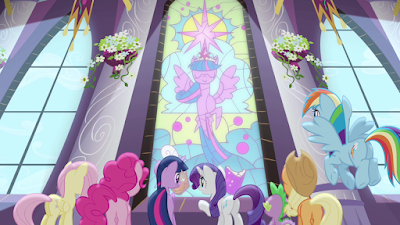 At the end of the third season, Twilight Sparkle was crowned "Princess of Friendship," and her library turned into a glittering castle for her and her companions to solve friendship problems that they were guided to by an enchanted map. Though this was a heroic and adventurous task, it didn't quit fit the rank of "princess," especially after Twilight Sparkled was mentored by Princess Celestia for that very purpose. The Crystal Empire, another kingdom in Equestria, is run by Twilight's brother, Shining Armor, and sister-in-law, Princess Cadance, but Twilight had never been given her own kingdom to run. Instead, she ends up running a friendship school for ponies and other mythological beings that inhabit her universe during the forgettable eight season of the show. Twilight's obsession with learning and studying make her more fit to run a school than an entire kingdom, but the problem is that she still has that title looming over her. She would much rather run a school than be an actual princess, judging by her freak out session when Princess Celestia and Princess Luna tell her that they are retiring and would like Twilight to be their successor in the opening scene of "The Beginning of the End." Even though these plans later get delayed in the two-part premiere, it is clear that the series is intended to conclude with Twilight's takeover over Canterlot. The new season kicked off with one of my favorite jokes in the entire show. 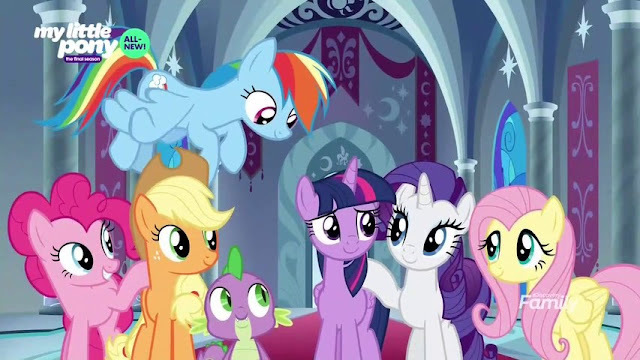 When Twilight asks her friends how she can possibly run the kingdom without Celestia or Luna's help, Rainbow Dash points out that the two most powerful princesses in the land had never done anything to help them through any of the other calamities they faced together over the course of the series, and Applejack makes note of this as well. This was something that had always bothered me, so I loved that someone in the show finally pointed it out. Princess Celestia and Princess Luna are supposed to be in charge of the safety and well-being of Canterlot, but whenever some sort of supernatural threat appears, they are never anywhere to be found, and it is always up to Twilight Sparkle and her friends to save the day. This was particularly apparent in the mediocre theatrical movie that the franchise released in 2017. In many ways, Twilight acts like more of a leader than Celestia ever did. This season's premiere did its best to resolve this plot hole by giving Celestia and Luna the opportunity take action by fighting off a deadly forest that came to life. By the end of the episode, they come to the conclusion that they didn't realize how much they enjoyed actually using their powers and decide to give Twilight more time to adjust to her new role (approximately 26 episodes worth of time). Of course, merely training to run a kingdom is not much of a plot in itself, so the season premiere also introduced a new big bad that the mane six will likely face off against in the finale. Grogar is an ancient ram sorcerer who spread darkness throughout Canterlot before the events of the series took place. He summons three villains that the ponies had defeated in previous seasons--King Sombra, Tirek, and Cozy Glow--in order to build a team strong enough to take on the mane six. This tradition of introducing an ultimate villain at the eleventh hour has been done in other princess shows such as Sofia the First, which concluded with Sofia's defeat of Vor. Giving the protagonists an opportunity to take on someone who is stronger than any being they had faced before gives the series a hopeful and conclusive ending that reassures the audience that the main characters will be willing and able to take on any challenge they might face after the curtain closes. Grogar seems to be the first villain on the show that appreciates the value of friendship. He asks other villains to team up with him before calculating his plans and eliminates those who attempt to stray from the group. My Little Pony: Friendship Is Magic has proven time and again that there is power in numbers, so his battle strategy could easily make him the biggest threat yet. I have thoroughly enjoyed every episode I have seen of My Little Pony: Friendship Is Magic, but I can't say that I'm disappointed it's ending. Nine years is a very long run for a series, especially an animated one, and I feel that it has already exhausted most ideas for new stories involving the mane six. That said, I'm very happy with the direction it appears to be taking for its final season. Twilight Sparkle's role as a princess never made much sense before without a kingdom for her to run. Since Princess Celestia was her mentor from the beginning, it is logical and fitting that she would eventually take her place. Grogar is already on the path to becoming one of my favorite villains from the show because he is the first to understand the benefits of friendship and to use it to his advantage, which makes me wonder how he will inevitably be defeated in the end. It looks like we are in for a wild ride for the remaining 24 episodes in the series. I have always dreamed of being a writer and creating the next great fairy tale princess heroine. Princesses inspire us to be our best selves. While you're here, feel free to follow my page on Facebook, subscribe to my YouTube channel, and check out my books. I'm also on Instagram and Twitter.